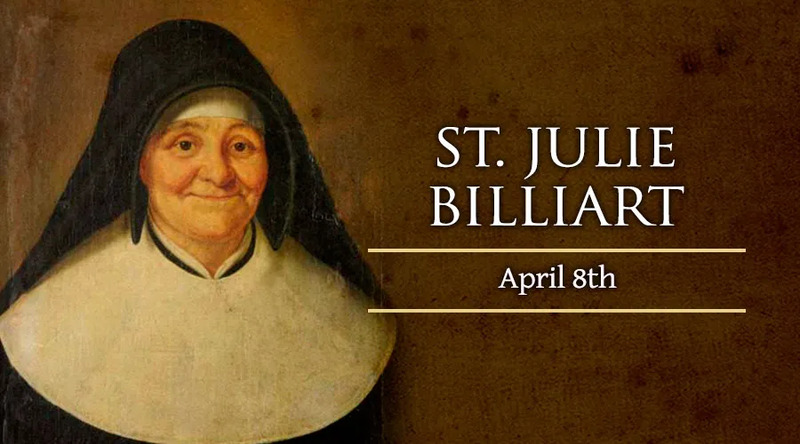 St. Julie Billiart, co-foundress of the Congregation of the Sisters of Notre Dame de Namur, came to her religious vocation late in life, at the age of 51. She was born in 1751, the fifth of seven children. As a child, she developed a great love for Jesus in the Eucharist. At 16, she began to teach to help support her family. However, due to a murder attempt on her father, she was plunged into very poor health for 30 years, 22 of which she was completely paralyzed. During this time she was very patient, and offered all of her sufferings to God. During the French Revolution, Julie opened her home as a hiding place for loyal priests, forcing her to flee from danger several times. She also received a vision of the Crucified Christ, surrounded by a large group of women dressed in habits. An inner voice told her that she would begin a religious institute for the Christian education of young girls. Julie and a rich young woman began the teaching order in 1803. In 1804, Julie was miraculously cured and could walk again. She died peacefully in 1816 at age 64. Pope Paul VI canonized her in 1969.